This bright red Everest K3 portable typewriter was imported into Australia by Tom of Elgin Street, North Carlton, Melbourne, and its serial number is 1053154. 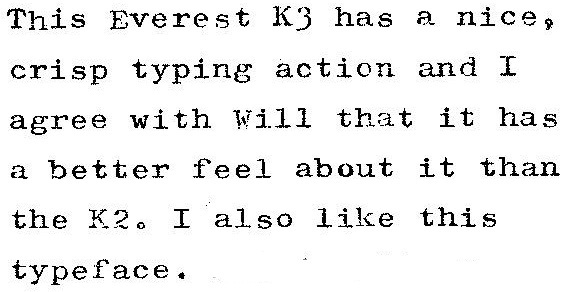 Alan Seaver, on his Machines of Loving Grace website, says of the Everest K3: “It's been pointed out on the Yahoo Portable Typewriter Forum that this model isn't supposed to exist. One of four known specimens [now there's at least five, Alan]. "Serial number records hint that this machine was only produced from 1960-1962, with the last serial number being 1112000, so this one is truly from the end of the line. In July last year, Will Davis on his Davis Typewriters Work blog reported that at Richard Polt’s collectors' convention in Cincinnati the previous month, Will had met Alan, who offered Will his K3. Will described the K3 as “a compact if not flat machine which surprisingly incorporates segment shift. “The … serial number 1101320, which according to the British OMEF Typewriter Age Guide means that the machine was made in 1962 - the last of three years in which the K3 was made. 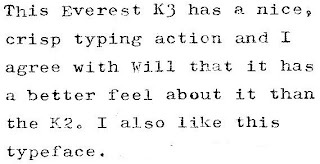 “Everest had at that time been bought out by Olivetti and production was running down; the standards and the larger desk-model K2 portable ended at this same time. “The K3 is a fairly well made machine, with metal body and interesting plastic (lucite?) paper support. The segment shift action is positive in feel and in point of fact the machine is superior to a few contemporary flat machines, as for example the flat Royals from Holland, in touch. That is indeed a nice typeface, and the machine is a good find for a portables specialist, to be sure! For a machine that isn't supposed to exist, that sounds amazingly good! It's OK to type with. But it just doesn't compare to the Olivettis. My early 50s Lettera 22 is far snappier, even though its keys need to travel almost a half inch further to get the typeslug to contact the paper. And my Mexican-made 70s Lettera 32, which requires much less force on the keys than the 22, surpasses the K3 in every way. Both Olivettis boast trimmer profiles than the K3. And they're lighter. Let's see: less weight, easier to tote, and more fun to type with. Now there's an unflattering comparison. PS: Congrats all all the great machines you will be displaying in Canberra. And thanks for creating this great blog. Hello just purchased a K3 the other day serial number 1005563 good working order.Came with the original receipt for 25 pounds in 1962. Seems to work OK small marks on body but generally clean unit. Thought i would share with you Thanks. i have a baby blue everest k3 just wondered how much they are worth ?? ?